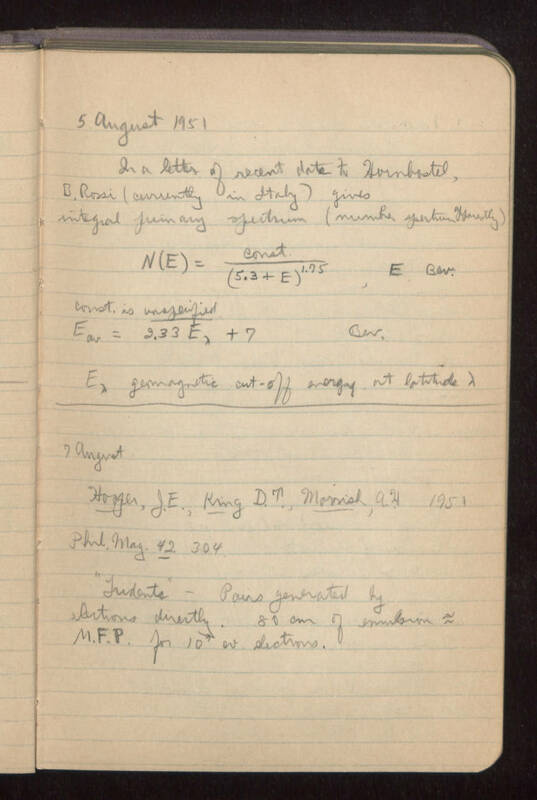 5 August 1951 In a letter of recent date to Hornbostel, B. Rossi (currently in Italy) gives integral primary spectrum (number spectrum apparently) N(E) = (((const.) / ((5.3 + E) exponent 1.75)) , E Bev. const. is unspecified ([E sub 0v?]) = (2.33 (E sub lambda)) + 7 Bev. (E sub lambda) geomagnetic cut-off energy at latitude lambda ------------------------------------------------------------------- 7 August Hooper, J. E., King D. T., [Mornish? Morrish? ], A. H. (1951) Phil. Magazine 42, page 304. "Tridents" -- Pairs generated by electrons directly. 80 cm of emulsion ~= M.F.P. for ((10 exponent 9) ev) electrons.